The slideshow below offers a full view of the works on display. 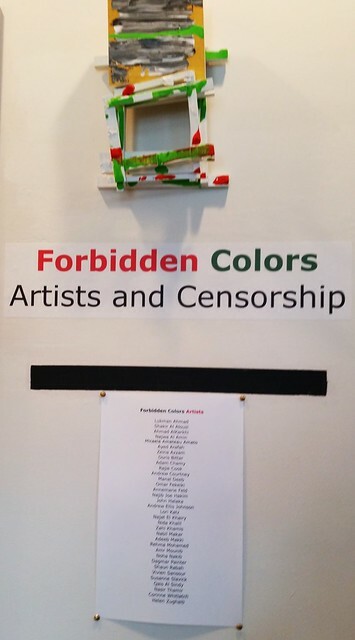 Artists from the United States and abroad create work in all media exploring the concept of artists’ responses to various forms of censorship or political pressure specific to artistic production. The show takes its name from a 1980 Israeli law forbidding artwork of “political significance,” which banned art composed of the four colors of the Palestinian flag: red, green, white, and black. Palestinians were arrested for creating or displaying such artwork. The ban was lifted after the signing of the Oslo Accords in 1993.